Definitely recommend watching the broadcast of this issue on the House Floor. Check it out here. AUSTIN, Texas — The House gave its final approval Tuesday to scaling back the law allowing automatic college admissions for high school students in the top 10 percent of their graduating class, a limit sought by the University of Texas at Austin. Under the compromise bill, approved 123-20, the university could cap the number of Texas students admitted under the program to 75 percent of the entering resident freshman class. The bill would take effect in 2011, meaning it would cover students who are sophomores in high school this year. "It's focused almost exclusively on UT-Austin," said Republican Rep. Dan Branch of Dallas, sponsor of the bill. Officials with the university have been pressing for such a change all session. They say they have lost control over who is admitted to the school because of the automatic admissions provided for in the existing law. Most of the freshman class each year at the university is automatically occupied by students who graduated in the top 10 percent. Differences will now have to be worked out between the House and Senate versions of the bill. The Senate provided for a cap at all state universities. Two attempts by Rep. David Leibowitz, D-San Antonio, to amend the House bill Tuesday to hold down college tuition rates failed. One of his proposals would have frozen tuition for freshman at their first-year rate for four years, an idea Republican Gov. Rick Perry put forth a few months ago. "It helps that student get out earlier, opens up a slot for another freshman," Leibowitz said. "We can bring in the next crop of freshmen." The proposal approved in the House would expire after six years so the Legislature could judge the impact of the law and decide whether to continue it. It also would limit the number of nonresident students to 10 percent of the student body if the cap has taken effect. The top 10 percent law was adopted a decade ago after a federal appeals court ruled affirmative action was illegal in Texas college admissions. In 2003, the U.S. Supreme Court allowed universities to use race as one of many decision-making factors. A number of minority legislators and organizations say the top 10 percent law has improved racial and ethnic diversity at major universities. Supporters of changing the law say it has caused a "brain drain" at UT-Austin, prompting exceptional students who fall just outside its top 10 percent parameters to go elsewhere, including out-of-state schools. The top 10 percent cap bill is SB175. While HB 3 does include multiple criteria assessment in grades 3, 5, and 8, it increases the stakes attached to testing at the high school level. Not only do the tests account for 15% of course grades but students are still required to pass end-of-course exams to receive a high school diploma. Failure to pass either two if the HB prevails, or up to 8 according to the SB would deny students a HS diploma. The multiple criteria does not apply at this level. Interventions and sanctions in both bills are no less punitive as the reform would create a three tier system: acceptable, warned, and probation. The SB also adds language that would seek to expose and attribute downward trends in test performance over three years to the promotion of students and can consequently reduce a school's accreditation. So somehow the authors of SB 3 seem to think that they can find causality between promotion and declining test scores. We'll see how things play out in conference. Addressing the veto specter surrounding the school accountability bill, school leaders said Tuesday the worst thing that could happen for students is nothing at all. “My concern is that we do nothing,” said Salem Abraham, president of the Canadian ISD Board of Trustees and member of the interim committee that examined the accountability system. “I’m hopeful that we wouldn’t do all this work and take all this public input and in the end have this thing vetoed,” Abraham said on a conference call organized by several school groups. Gov. Rick Perry has indicated that he is displeased with the direction of the school accountability bill, particularly a change in the rules for promoting kids the next grade even if they fail the Texas Assessment of Knowledge and Skills. Current law prohibits “social promotion” for third-graders, fifth-graders and eighth-graders who do not pass certain tests. But in practice, most of those students do get moved along to the next grade by a panel of teachers, principals and the parents. A veto would leave in place the current law that many say is too punitive and puts too much focus on a single test. The companion bills crafted by education leaders in the House and Senate lessen the focus on high-stakes testing in the lower grades and return the grade promotion decision back to schools. Those bills were developed in light of the public testimony in hearings across the state last summer. As conferees hammer out the differences between the House and Senate versions of the bill, Spring Branch Superintendent Duncan Klussmann said they face a decision between staying on the path recommended by the interim select committee or moving away from those recommendations. This recently happened in Texas where South Texas College in the Valley was granted the authority to offer bachelor degrees. It led to both criticism from the THECB's commissioner (because god forbid a So. Texas community college could be offering a rigorous bachelor degree) and an investigation to examine if their BS programs were watered down was done. That investigation ended up revealing that STC exceeded the quality that equivalent programs in four-year institutions were offering both in Texas AND in the nation. MIAMI — When LaKisha Coleman received her associate’s degree at Miami Dade Community College six years ago, her best bet for a bachelor’s degree seemed to be at the more expensive Florida International University. But nowadays, Miami Dade College — the “Community” has been dropped — offers bachelor’s degrees in teaching and nursing and public safety management, and will soon add engineering technology, film production and others. Ms. Coleman returned to Miami Dade two years ago and is about to graduate with a degree in public safety management. Ms. Coleman now recommends the college to family members. “It’s much cheaper, the teachers are good, you can do it in the evening while you work, and everyone’s very helpful,” she said. As Ms. Coleman discovered, the line between community colleges and four-year universities is blurring. Florida leads the way, with 14 community colleges authorized to offer bachelor’s degrees, and 12 already doing so, in fields as varied as fire safety management and veterinary technology. But nationwide, 17 states, including Nevada, Texas and Washington, have allowed community colleges to award associate’s and bachelor’s degrees, and in some, the community colleges have become four-year institutions. Others states are considering community college baccalaureates. In most cases, the expanding community colleges argue that they are fulfilling a need, providing four-year degrees to working people who often lack the money or the time to travel to a university. But some of those universities are fighting back, saying the community colleges are involved in “mission creep” that may distract them from their traditional mission and lead to watered-down bachelor’s degrees. “It’s cooking in several states, in many work-force-related fields, but there’s a lot of debate and politics, and differing views on whether they’re still community colleges if they give baccalaureates,” said Beth Hagan, executive director of the Community College Baccalaureate Association, a nonprofit group that promotes the trend. In Michigan, community colleges are seeking to offer baccalaureates in culinary arts, cement technology and nursing. Their efforts have stalled, said Mike Hansen, president of the Michigan Community College Association. Some critics worry that community college baccalaureates will drive up costs, take resources from needy students and lead to low-quality degrees. At Miami Dade College, more than 1,000 students are enrolled in baccalaureate programs. Their average age is 33; three-quarters are women, and slightly more than half are Hispanic. Miami Dade’s president, Eduardo J. Padrón, said the baccalaureate programs were part of his institution’s mission of serving the community. He emphasized that the programs required the same kinds of general education courses as four-year universities. Miami Dade’s baccalaureate courses feel unlike a typical college class. In a recent Monday evening class, Ms. Coleman and others were quick to share experiences from outside the class. The evening’s topic was correctional officers — their pay, job requirements, working conditions and subculture. One student knows a guard who was fired for trafficking in cellphones; another tells of how the guards treated visitors when her son was in jail. Almost all had earned their associate’s degree, a prerequisite for the baccalaureate programs, at Miami Dade and had taken some classes at Florida International, but had found them expensive and unsatisfying. Ms. Coleman, the third of 10 children, took 10 years after high school graduation to earn her associates’ degree because she was working and had to take semesters off to care for her younger siblings and ailing mother. Dr. Padrón said community colleges existed to serve students like Ms. Coleman. “We have an open-door policy, and we serve 62 percent of Miami-Dade district graduates who go to college,” said Dr. Padrón, referring to the local public school system. “Eighty percent of our students work, and 58 percent of them come from low-income families. Dr. Padrón said he had no plans for Miami Dade to become Miami Dade State College, as it is entitled to be. Some community colleges that offered baccalaureates have, however, morphed into four-year institutions, repeating a pattern in American higher education. Community-college baccalaureates challenge the educational hierarchy’s boundaries between the research mission of universities, the teaching mission of colleges and open admissions for community colleges. BOSTON - April 28 - Despite billions of dollars spent on a test-and-punish approach to school "reform," today's National Assessment of Educational Progress (NAEP) report provides more evidence that the federal No Child Left Behind Law (NCLB) is a failure. With few exceptions, across three age groups and two subjects, the rate of improvement slowed compared with the previous period while gaps between blacks and white as well as Hispanics and whites ranged from widening to unchanging to slightly closing. "NCLB is demonstrably unable to produce sustained and significant improvements even on a standardized test in the two subjects on which it focuses, reading and math. It also fails to make a real dent in the wide gaps between whites, African Americans and Latinos," said Monty Neill, Ed.D., FairTest's Deputy Director. "It is time to completely overhaul this educationally destructive law. The Forum on Educational Accountability has produced a blueprint to rewrite the law to focus on improving schools not just inflating state test scores." Neill chairs the Forum, whose Joint Organizational Statement on NCLB is endorsed by 150 national education, civil rights, religious, disability, parent, labor and civic groups. Since NCLB, state test scores have typically increased, but NAEP results have failed to show similar increases. "This is a clear sign that schools are pressured to narrow curriculum and teach to the state tests. That inflates state test scores but the inflated scores don't mean real learning has improved," explained FairTest's Lisa Guisbond. "NCLB has proven to be counter-productive. The Obama administration and the Congress must take the necessary steps to craft helpful, not harmful, federal legislation." The black-white reading gap closed 3 points (statistically significant) while the Hispanic-white gap closed 4 points, also statistically significant. However, the Hispanic-white gap closed 7 points from 1999-2004, and the black-white gap closed 9 points from 1999-2004, about three times as fast. That is, while the racial gaps keep closing, the rate of closure has slowed dramatically. Similarly, there have been score gains for blacks and Hispanics, but the rate of improvement for both groups slowed in the 04-08 period compared with the 99-04 period. Age 13 reading: scores rose modestly but were approximately level with the scores of the early to mid 1990s. The black-white gap closed 4 points from 2004-2008, but that gap closed 7 points from 1999-2004. The Hispanic-white gap actually widened by 2 points from 2004-08 after widening one point in the 99-04 period. Actual scores have improved for blacks, but not for Hispanics. Age 17 reading: again, scores gained modestly, but in this case they have not returned to the higher levels reached from the late 1980s through the 1990s. Age 9 math: the largest gains in the past were from 1986-90 (8 points) and 1999-2004 (9 points) - both 2 points per year gains. However, the 4-point gain from 2004 to 2008 averages only 1 point per year, showing that improvement rates have declined in age 9 math since NCLB took hold. From 2004-08, the black-white gap widened by 2 points and the Hispanic-white gap remained unchanged, with no changes being statistically significant. Age 13 math: in the five-year span from 1999 - 2004 NAEP rose 5 points, or 1 point per year. In the four years under NCLB, from 2004 to 2008, NAEP gains were only 2 points, or half the rate of improvement in the previous period. The NAEP results are at http://nationsreportcard.gov/ltt_2008/ with links to overall trends and trends by racial groups. If there's anything worth celebrating in HB 3 it's the addition of multiple criteria, which is being criticized here. The call for 2 our of 3 (8 total) end-of-course exit exam requirements is just excessive. AUSTIN – Gov. Rick Perry has warned legislative leaders that he may veto a wide-ranging school accountability bill if it scraps the state's longtime rules to curtail social promotion – the practice of automatically passing students regardless of achievement. The governor has informed the chairs of the House and Senate education committees that he strongly disagrees with their decision to drop the current requirement that students in grades three, five and eight pass the Texas Assessment of Knowledge and Skills to be promoted to the next grade. Senate Education Committee Chairwoman Florence Shapiro, R-Plano, and House Education Committee Chairman Rob Eissler, R-The Woodlands, said Tuesday they are seeking a compromise to gain Perry's support for their legislation. But they still want to drop the testing mandate. A spokeswoman for the governor said Perry believes any change to the requirement – originally championed by George W. Bush when he was governor – would weaken academic standards in the schools. "We need to maintain strong accountability standards in our schools and not reverse course on social promotion," said Allison Castle, the governor's press secretary. School superintendents across the state, including Dallas' Michael Hinojosa, have urged lawmakers to drop the state requirement and allow local officials to determine their own criteria for promoting students. Separate bills passed by the House and Senate would do just that; local promotion standards would be based on test scores, course grades and teacher recommendations. "That has been one of the major complaints about the TAKS test, that it is a one-day minimum skills test that has such serious consequences," Eissler said. "We're trying to give kids another pathway." Shapiro agreed there is a problem when a student can do grade-level work in all his classes but still be held back in the same grade because of a poor score on the TAKS test. "If a child is doing better in class, he shouldn't be held back solely because of test scores," she said. Studies indicate that the test requirement slightly raised the number of students retained in grades three, five and eight, but many who failed the TAKS were still promoted under an exception that allows a student to move up if his teacher, principal and parents agree. While Shapiro and Eissler agree on the promotion requirements, they disagree on another major part of the school bill – how many tests high school students should pass to earn a diploma. Shapiro and the Senate voted to require that students pass two of three end-of-course tests in each major subject area – English, math, science and social studies. Eissler and the House voted to require passage of just two of the 12 end-of-course tests – the English III and Algebra II exams. They'll have to compromise on such differences in the next few days for the bill to become law. SAN JUAN — Learning the three R's in English and Spanish simultaneously did not come easy to Oscar Martinez at first. Martinez started participating in the Pharr-San Juan-Alamo school district's dual-language program when he was in kindergarten at Pharr Elementary School. Having learned only English at home, Martinez, now 18, found it difficult to understand some of his teachers who would give lessons in Spanish. By sixth grade, however, he could read, write and carry on conversations in his second language. But the most encouraging result for him was that he was finally able to have a conversation in Spanish with his grandfather, something he hadn't been able to do without help from family members. "I just felt so accomplished," said Martinez, who is among the first cohort of students in the district's dual-language program. This year, 45 seniors from PSJA and PSJA North high schools are graduating from their respective institutions knowing how to communicate in English and Spanish through a program they have been enrolled in since elementary school. The school district began its dual language program 13 years ago so its students would become fluent at speaking, reading and writing English and Spanish. Parents and other members of the community had been asking the district why their children were not able to speak Spanish and English well enough to communicate with others. The district wasn't satisfied with bilingual programs already in place in the area, said Rosalva Silva, the district's bilingual education coordinator. So the district sought and obtained a federal grant to implement the dual language program. The program's intent is to teach students a new language while retaining the skills of their first language. All students are welcome to participate in the program in the schools that offer it, but students with limited English proficiency are required to take part in the program, Silva said. "We thought, ‘Why not produce students who are going to be marketable?'" she said. The program began at Pharr and Palmer elementary schools. As the students in the dual-enrollment program progressed to middle and high school, the program followed them, expanding to Liberty Middle School — where all the dual-enrollment students attended after elementary school — and then to PSJA and PSJA North high schools. Students at the elementary level begin taking half of their subjects in English and half in Spanish. By the time they enter middle and high school, students are able to seek college credit for Spanish while continuing to take classes in both languages. They are expected to be fully bilingual and bi-literate by the time they graduate from high school. Because it was the only public school district in the Rio Grande Valley — and probably among a handful of districts throughout the country — to take on this endeavor, the PSJA district had to overcome obstacles and create the program as it progressed. For one, the district didn't know where it would find teachers who could teach subjects like math and social studies in Spanish. The district wanted students to learn Spanish and English well enough that they could communicate effectively in both languages when they entered the workforce, Silva said. Administrators thought they were going to have to hire teachers from Mexico. But they decided to look within their district first and found faculty who could teach those subjects in Spanish, Silva said. While curricula were available for elementary schools, very little was available at the secondary level. Middle and high school teachers had to develop their own curricula for their students, translating lessons from English to Spanish, Silva said. "We've been very pleasantly surprised," she said. The district continues to struggle with the challenges of educating immigrants who were not attending school before their move to the United States. Educators have found that placing those students in the dual language program helps them catch up to their peers because they're taking some classes in their native language. By building their skills in their first language, those students are able to pick up English, Silva said. The program has been considered a success, and earlier this month representatives from national and state education policy groups visited PSJA High School as part of a weeklong tour of the Valley hosted by the American Youth Policy Forum. Martinez and other students told the visitors about their experiences with the program and offered advice on how to help students if other schools were to follow suit. All students said the dual-language program gave them the confidence to take on any challenge. Martinez, who is set to graduate with more than 40 college credit hours, is taking more classes this summer at the University of Texas-Pan American before starting in the fall at Texas A&M University in College Station as a sophomore. He plans to attend law school and return to the Valley to practice law. "I'm going to have clients who are not going to know English. I'll be a bilingual lawyer," he said. That's a goal he said he's able to achieve because of the dual-language program. Check out the video clip of parent's speaking out . EL PASO, Texas -- It's been a battle between parents and administrators when it comes to the Texas Assessment of Knowledge and Skills test results and walking during graduation. But the battle brewing at Americas High School has more to do with what students say one administrator told them. Johnny Martinez found out his daughter will not walk in her graduation because she didn't pass the TAKS test. The state policy is that if a student doesn't pass the TAKS, the student doesn't walk during graduation. But Martinez said the Americas assistant principal told his daughter and other students the opposite. "She said, 'Kids, don't worry about it, if you don't pass the test, you'll still be able to walk,'" said Martinez. Martinez said he believes his daughter was lied to. "I don't have a problem with policy. What I have a problem with is kids being lied to by an individual with authority. What kind of an example are we setting for the kids?" said Martinez. That's the same story we heard from another parent, Leticia Dunn. "Mrs. Ochoa has mentioned to the students that even if they didn't pass the TAKS test they were going to be allowed to walk and maybe complete the test later on," said Dunn. Both parents, Martinez and Dunn talked to school and district administrators but to no avail. They said the assistant principal told the students inaccurate information and went back on her word. "Who is the one that told them that they were going to be able to walk if they didn't pass. She said, 'I don't know where they got that from.' She went backwards on what she had told the students," said Dunn. Socorro Independent School District spokeswoman said it was a misunderstanding. The assistant principal told the students they were still going to receive a diploma even if they didn't pass the TAKS. The students will still have to go through an intense tutoring program in the summer to try and pass the TAKS test. The Texas Education Agency is expected to release TAKS Test results soon. And those are important numbers for Pearce Middle School and Reagan High School, which could be shut down for failing to meet state standards. While the official numbers are not back yet, schools have some preliminary data. The district is not officially commenting. Late Wednesday KVUE learned the results showed lots of improvement, but it will be very close. Allen Weeks is the head of the St. John Neighborhood Association. He's rallied support for both Reagan High School and Pearce Middle School. "At Reagan, since January, we've had over 400 mentors and tutors added to the school," Weeks says. He believes it's made a difference. "It just feels good at these schools right now. If you go into a school that's demoralized and low performing, it doesn't feel good. These schools feel like they're on their way up," says Weeks. And they have to be. They're facing possible closure by the state if students don't pass the TAKS Test. Pearce has failed to meet state standards for four years; Reagan for three years. But both principals are optimistic. Anabel Garza is a first-year principal at Reagan. "They've really listened to their teachers and done exactly what they've been asked to. The teachers have worked tirelessly, weekends, evenings, all the time. So the mood, though, is very optimistic and hopeful," says Garza. She says the school is focused on test result data to target students' weak areas. And she says students have stepped up in the weeks before the exam. "Any place, before school, after school, the tutoring was going on and kids were seeing it out. So the community was coming in and helping us," says Garza. One of Reagan's feeder schools is Pearce Middle School. The state will likely shut down this school if it fails to meet state standards for the fifth year. Principal James Troutman doesn't think that will happen. "We looked at the growth of our 8th grade students in reading. Last year in reading only 50% of them had passed the 7th grade reading. This time in 8th grade - the same group of kids had a 27 point jump. 77% of them passed," says Troutman. But there are several tests results still out there. And the district has already had to start creating contingency plans for students if the state shuts down either one of these schools. Another possible safety net for these schools is a bill in the Texas Legislature that appears will pass; it gives schools an additional year to meet state standards. Thursday at Reagan, there will be a community forum to discuss student options if this school closes. As thousands of Houston-area high school seniors prepare to accept their diplomas in the coming weeks, a study released Friday shows that only 58.5 percent of the region’s freshmen make it to graduation day. Children at Risk, a Houston-based advocacy group, commissioned the Texas Education Agency to conduct study of six-year graduation rates for the region’s 130 high schools. They learned that 53 percent of the students who begin as ninth-graders in the Houston Independent School District had not graduated from any Texas high school in six years. The combined graduation rate for the entire region’s high schools is 58.5 percent. 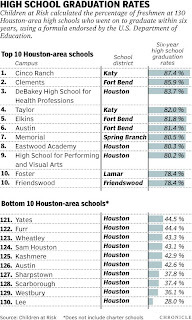 The 12 noncharter high schools with the worst graduation rates, the study concluded, are all Houston ISD campuses. Sanborn said HISD estimates it graduates as many as 77 percent of its students within four years. That number is based on faulty data that doesn’t count as dropouts students who claim they’re going to be home schooled, attend private school or move out of state or country, he said. Sanborn said the first step in fixing high schools is admitting the severity of the problem. He called for the Legislature, the TEA and individual school districts to become more transparent and use the graduation rate calculation formula Children at Risk used in this study. Several area school districts posted graduation rates that were worse than Houston’s, including North Forest (45.7 percent), Dickinson (46.4 percent), Channelview (48.5 percent), and La Marque (51.8 percent). Though alarming, Sanborn said he wants schools to keep track the way his group did so people are spurred to take action to better the schools through longer school days, extended school years, smaller learning communities and other methods he said are proven to help students learn and stay in school. Karen Garza, HISD’s chief academic officer, said the district sees dropouts as an important problem that they are working to address. She suggested the Children at Risk numbers fail to consider how mobile the population of this urban school district is by excluding students who may start here but graduated in Oklahoma or Mexico or anywhere outside of Texas. But, Garza said, HISD uses the formula prescribed by the TEA, and she doesn’t see the Children at Risk calculation as being any more reliable. Sanborn said they followed the suggestions of former U.S. Education Secretary Margaret Spellings’ administration. The group had the TEA analyze the 2001-2002 class of freshmen and track them through six years and count them if they graduated from a high school anywhere in Texas. They were not counted as graduates if they went to private school, left the state or were home schooled. Linda Roska of the TEA said her agency follows guidelines from the National Governors Association but might alter the math if the new federal administration adopts some of Spellings’ suggested changes. But Roska was unsure whether what Children at Risk did was what the federal government might want. Sanborn acknowledged he doesn’t expect the state Legislature to address this statistical issue this session, which ends June 1. Urban schools in the region graduated 55 percent of freshmen under the advocacy group’s method and suburban schools graduated 68.6 percent. The highest local graduation rate in Sanborn’s study was at Friendswood ISD with 78.4 percent and the lowest was North Forest ISD with 45.7 percent. Friendswood reported a 94 percent four-year graduation rate to the state in 2007, the same year the Children at Risk study ended. Among school districts with multiple high schools, Katy, Fort Bend and Cypress-Fairbanks posted the highest graduation rates. The politics surrounding this issue is really worth checking out. Here's the link to the video stream. AUSTIN, Texas — The Texas House passed legislation Monday that would scale back the automatic college admissions policy for students who graduate in the top 10 percent of their high school class. Under the compromise bill, approved on a 121-24 vote, universities could cap the number of Texas students admitted under the program to 75 percent of the entering resident freshman class. The bill would take effect in 2011, affecting students who are high school sophomores this year. The reforms would expire after six years, giving the Legislature time to judge the impact and either continue the policy or make changes. The legislation also would limit the number of nonresident students to 10 percent of the student body at universities where the cap has taken effect. The measure is of particular interest to the University of Texas at Austin, where more than 80 percent of the home-state freshman class are admitted under the rule. The school has been pushing the Legislature to allow it to start cutting back on such automatic admissions. The top 10 percent law was adopted a decade ago after a federal appeals court decision made affirmative action illegal in Texas college admissions. In 2003, the U.S. Supreme Court allowed universities to use race as one of many decision-making factors. Efforts to change the policy, or place a cap on the number of students being admitted under it, have fallen apart in past legislative sessions. Opponents of modifying the rule say the law has improved ethnic and geographic diversity at major universities over the past decade. But UT Austin is on the verge of an admissions crisis, and legislators have heard their cries. In a passion-filled speech, Rep. Sylvester Turner, D-Houston, called on UT and other schools to do a better job of attracting qualified minority students but said he wanted to give them more discretion in their admissions process. "The ball is now in UT's court," Turner said. "I hope they're prepared to run with it on the academic field." Proponents of the reforms say the top 10 percent law has caused a "brain drain" at UT, prompting exceptional students who fall just outside its parameters to go elsewhere. "This is about fixing an imbalance," said Rep. Dan Branch, R-Dallas, author of the legislation. "What starts here will change UT and I think will improve the University of Texas." The bill would still give automatic admission to top high school achievers. But it would cap the number universities have to admit. A different version of the legislation passed the Senate in March, so there are still plenty of hurdles to overcome before the bill can become law. The moves to modify the law has been met with skepticism by some minority groups, including the National Association for the Advancement of Colored People and the Mexican American Legal Defense and Educational Fund. Rep. Roberto Alonzo, D-Dallas, spoke out against the legislation. He said Texas universities are not working hard enough to reach out to kids who qualify now under the top 10 percent law now, and he cautioned against changing it. "The problem is the implementation of the laws," he said. "We have laws and we can trust and pray but we've got to implement the laws." Paul Hawken is a renowned entrepreneur, visionary environmental activist, founder of Wiser Earth and author of many books -- most recently Blessed Unrest. Last week, he was presented with an honorary doctorate of humane letters by University of Portland, when he delivered this superb commencement address to the class of 2009. There is invisible writing on the back of the diploma you will receive, and in case you didn’t bring lemon juice to de code it, I can tell you what it says: YOU ARE BRILLIANT, AND THE EARTH IS HIRING. The earth couldn’t afford to send any recruiters or limos to your school. It sent you rain, sunsets, ripe cherries, night blooming jasmine, and that unbelievably cute person you are dating. Take the hint. And here’s the deal: Forget that this task of planet-saving is not possible in the time required. Don’t be put off by people who know what is not possible. Do what needs to be done, and check to see if it was impossible only after you are done. You join a multitude of caring people. No one knows how many groups and organizations are working on the most salient issues of our day: climate change, poverty, deforestation, peace, water, hunger, conservation, human rights, and more.This is the largest movement the world has ever seen. The living world is not "out there" somewhere, but in your heart. What do we know about life? In the words of biologist Janine Benyus, life creates the conditions that are conducive to life. I can think of no better motto for a future economy. We have tens of thousands of abandoned homes without people and tens of thousands of abandoned people without homes. We have failed bankers advising failed regulators on how to save failed assets. Think about this: we are the only species on this planet without full employment. Brilliant. We have an economy that tells us that it is cheaper to destroy earth in real time than to renew, restore, and sustain it. You can print money to bail out a bank but you can’t print life to bail out a planet. At present we are stealing the future, selling it in the present, and calling it gross domestic product. We can just as easily have an economy that is based on healing the future instead of stealing it. We can either create assets for the future or take the assets of the future.One is called restoration and the other exploitation. And whenever we exploit the earth we exploit people and cause untold suffering. Working for the earth is not a way to get rich, it is a way to be rich. So I have two questions for you all: First, can you feel your body? Stop for a moment. Feel your body. One septillion activities going on simultaneously, and your body does this so well you are free to ignore it, and wonder instead when this speech will end.Second question: who is in charge of your body? Who is managing those molecules? Hopefully not a political party. Life is creating the conditions that are conducive to life inside you, just as in all of nature. What I want you to imagine is that collectively humanity is evincing a 20 deep innate wisdom in coming together to heal the wounds and insults of the past. This extraordinary time when we are globally aware of each other and the multiple dangers that threaten civilization has never happened, not in a thousand years, not in ten thousand years. Each of us is as complex and beautiful as all the stars in the universe. We have done great things and we have gone way off course in terms of honoring creation. You are graduating to the most amazing, challenging, stupefying challenge ever bequested to any generation. The generations before you failed. They didn’t stay up all night. They got distracted and lost sight of the fact that life is a miracle every moment of your existence. Nature beckons you to be on her side. You couldn’t ask for a better boss. The most unrealistic person in the world is the cynic, not the dreamer. Hopefulness only makes sense when it doesn’t make sense to be hopeful. This is your century. Take it and run as if your life depends on it." Doesn’t Every Child Deserve a High Quality Education? On May 17, America will mark the 55th anniversary of Thurgood Marshall’s historic victory in Brown v. Board of Education. If Marshall were alive, however, he would urge us to stop celebrating 1954 and start accepting responsibility for our complicity in the creation of a "separate but equal" education apartheid system – with one method of instruction for the poor, and another for the privileged. In theory, the Brown decision represents the most hopeful strains of the American narrative: working within a system of laws to extend the promise of freedom, more fairly and fully, to each succeeding generation. "In the field of public education," the unanimous Court wrote, "the doctrine of ‘separate but equal’ has no place," and the opportunity to learn "is a right which must be made available to all on equal terms." The Chicago Defender proclaimed May 17, 1954 as "the beginning of the end of the dual society in American life and the system of segregation that supports it." Marshall himself remembered feeling "so happy I was numb." In practice, integrated schools today are as much of a dream now as they were then, and the subject of segregation has all but disappeared from the national conversation about education reform. Worse still, many of the newest and most promising schools in our nation’s cities are actually increasing the racial stratification of young people and communities – not lessening it. Providing ‘separate but equal’ facilities, it seems, has once again become an acceptable justification for allowing an inequitable schooling system to exist. In this system, some schools receive ample funding, while others scrape by. Some schools are filled with passionate, experienced educators, while others are flooded with passionate, inexperienced rookies. And while one child is being taught that the key to success is finding the right (multiple-choice) answer to other people’s questions, another is learning that success comes from finding his voice and discovering his rightful place in the world. Which child is more likely to do well in life, and in a democratic society? Ostensibly, this inequity was what the Court ended in 1954. But legal changes tend to outpace social changes, and so in 1973 the Court was again asked to intervene, this time when a group of poor Texas parents claimed that their state’s reliance on local taxes to determine per-pupil expenditures violated the Equal Protection Clause of the 14th Amendment. A state court agreed, but the U.S. Supreme Court, in a narrow 5-4 decision, reversed. The unfair distribution of resources, Justice Potter Stewart conceded, "has resulted in a system of public education that can fairly be described as chaotic and unjust. It does not follow, however, that this system violates the Constitution." Justice Lewis Powell agreed. "Though education is one of the most important services performed by the state, it is not within the limited category of rights recognized by this Court as guaranteed by the Constitution." If it were, Powell conceded, "virtually every State will not pass muster." For Justice Marshall, a sitting member of the Court he had stood before two decades prior, that was precisely the point. "The Court concludes that public education is not constitutionally guaranteed," he wrote, even though "no other state function is so uniformly recognized as an essential element of our society’s well being." Marshall understood that without equal access to a high-quality public education, democracy doesn’t work. "Education directly affects the ability of a child to exercise his First Amendment rights," he explained. "Education prepares individuals to be self-reliant and self-sufficient participants in society. Both facets of this observation are suggestive of the substantial relationship which education bears to guarantees of our Constitution." After so many years and so little real change, something new – perhaps even something drastic – needs to be done. What if Powell and Stewart were wrong? What if we made the guarantee of a high-quality public education our nation’s 28th Constitutional Amendment? Is that the game-changer we need to make the promise of Brown a reality, 55 years later? Sam Chaltain is the National Director of The Forum for Education & Democracy, a national education "action tank" committed to the public, democratic role of public education — the preparation of engaged and thoughtful democratic citizens. An Overhaul of Texas' Accountability System? Interesting changes appear to be in the works for the state of Texas' accountability system, according to this story in the Dallas Morning News. The proposed changes, included in legislation moving through the House and Senate in Austin, would require students to meet new, higher college-readiness standards in English and language arts. But at earlier grades, the bills also would allow schools to promote students on a combination of factors, including test scores, grades, and teacher recommendations, as opposed to simply state test scores, according to the story. And state performance ratings of schools would be changed to consider growth in student scores on state tests, instead of only passing rates on those tests. What's driving the changes? According to the story, some Texas lawmakers believe the current system is simply not getting results. Specifically, while scores on state tests are increasing, scores on outside measures of students' college preparedness—the ACT and SAT—are not. And there's also a belief that the current system punishes schools and does not reward them for making progress, a point of view that's being voiced at the federal level, amid discussions of reauthorizing No Child Left Behind. "Our goal is to do improvement, not punishment—standards, not excuses," the chair of the state's Senate Education Committee is quoted as saying. "An amendment approved in the House would prohibit school districts from regulating the hair length of honor students who have no disciplinary record or unexcused absences." Bipartisan criticism sidelines confirmation of chairman. The legislative session so far has not been kind to the State Board of Education. Senate confirmation of Board Chairman Don McLeroy, R-College Station, is dead in the water, the Nominations Committee chairman said Thursday. The House of Representatives approved a constitutional amendment Monday that would move the investment decisions about the $17.5 billion Permanent School Fund away from the board to an appointed council of financial professionals. And a bipartisan group of senators has introduced a bill to take away the elected board's authority over curriculum and textbooks. A convergence of high-profile, bloody curriculum battles and controversial comments from some board members caught the attention of the legislators, both Republicans and Democrats, who could leave the somewhat obscure body headless and toothless after this session. Some of the legislators' concerns are rooted in policy differences, others in politics. Either way, the legislators are not pleased. Board member Pat Hardy, R-Weatherford, said the efforts to diminish the authority of the board are misguided because no one else is going to put the same time and attention into these important education issues. But, Hardy said, "we have drawn the ire of those people for a reason, because we have done some screwball things. ... We have managed to ignore a lot of things that (legislators) have very kindly asked us to take care of." Hardy, who has often been at loggerheads with the board's conservative faction, laid that problem at the feet of McLeroy, a religious conservative who has been accused of trying to inject religion into science classes. McLeroy said he did not want to comment on his confirmation. First elected in 1998, McLeroy, a dentist, was appointed board chairman by Gov. Rick Perry in the summer of 2007. Last week, McLeroy ran into a buzz saw during his confirmation hearing before the Senate Nominations Committee. Democrats Eliot Shapleigh of El Paso and Kirk Watson of Austin skewered McLeroy about his leadership, particularly during the recent brouhaha over science curriculum standards. "You've created a hornet's nest like I've never seen," Shapleigh said at the hearing. Committee Chairman Mike Jackson, R-La Porte, said Thursday that McLeroy's nomination will be left pending in committee because there is enough opposition on the floor of the Senate to block his confirmation, which requires approval of two-thirds of the senators. Perry would then pick a chairman from among the other board members who would not face Senate confirmation until 2011. Senate Democrats alone could stop McLeroy's confirmation. But Republicans, too, have taken issue with the board. Similarly, Sen. Robert Duncan, R-Lubbock, said the investment of the Permanent School Fund needs to be removed from the "hot political environment" that is the State Board of Education. A key conservative leader, Rep. Warren Chisum, R-Pampa, said he objected to stripping the board of any of its education oversight, though not its role in the Permanent School Fund. But he said that the legislators' wrath might signal to the board that it needs to look internally and focus on its core responsibilities.